This concise volume presents key concepts and entries from the twelve-volume ICA International Encyclopedia of Communication (2008), condensing leading scholarship into a practical and valuable single volume. Wolfgang Donsbach is Professor of Communication and founding director of the Department of Communication at Dresden University of Technology, Germany. 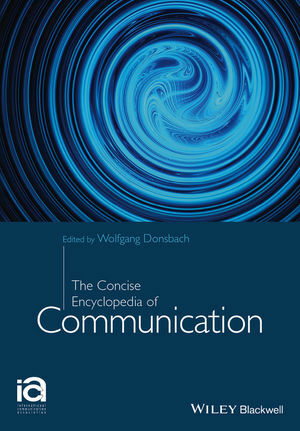 Donsbach served as the Editor-in-Chief for the 12 volume ICA International Encyclopedia of Communication (Blackwell, 2008) and is also the Series Editor for the ICA-Wiley-Blackwell International Encyclopedias of Communication. From 1995 to 1996 he was president of the World Association for Public Opinion Research (WAPOR) and from 2004 to 2005 president of the International Communication Association (ICA). He was editor of the International Journal of Public Opinion Research and serves, among others, on the editorial boards of Journal of Communication, Communication Theory, Human Communication Research, and the Central European Journal of Communication. Donsbach is an ICA Fellow and recipient of WAPOR’s Helen-Dinerman-Award for extraordinary achievements in public opinion research.